He took with him 25 crates containing Chinese antiques and treasures which he had collected during his 30 years in the Far East and told fellow passengers and ship's officers that among them were agate drinking cups looted during the Boxer riots from the Imperial Palace at Pekin, which carried a curse threatening disaster to anyone taking them out of the country. Then began a series of mishaps. First of all, while the crates were being loaded into the ship's hold, one of them struck and seriously injured a Chinese coolie. Three days later one of the British members of the crew began to suffer from delusions and, acting on instructions from a warship, the Samwater put back to Yokohama, where the man was taken ashore for hospital treatment. 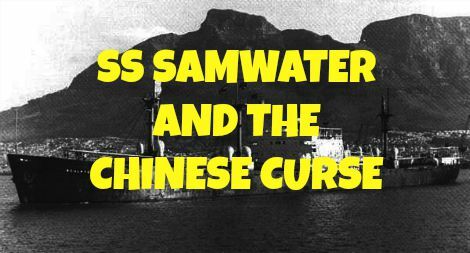 For sixteen days after leaving Shanghai on her way to Vancouver, the Samwater had to battle with heavy seas and fierce gales until one day the weather suddenly moderated. Then it was discovered that M. Bar had mysteriously disappeared. During the nine months we were away from England we had bad weather only on those 16 days during which M. Bar was on board," one of the crew told the "Western Morning News." "Apart from those 16 days we had a particularly lucky voyage." Capt. 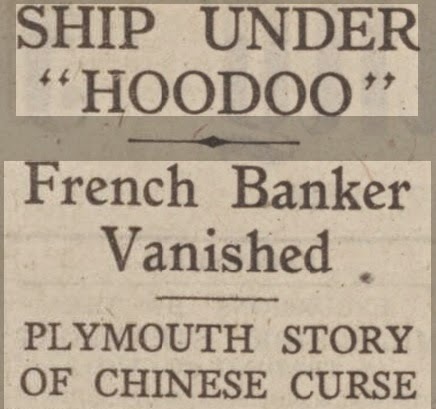 F. Howe, master of the ship, whose home is at Middlesbrough, said: "The ship never stopped rolling after we left Shanghai until M. Bar disappeared. He left the saloon as usual that night announcing that he was going to retire. "When it was found that his bed had not been slept in we made a thorough search of the ship, but there was no trace of him. It was a dark and windy night and we could only assume that while walking along the deck a heavy wave had washed him overboard. "His luggage, including the treasures, which he told me were worth £50,000, were put ashore at Vancouver. From then until we reached Plymouth we had a pleasant and uneventful voyage, and apart from those 16 days I should call it a very lucky commission." 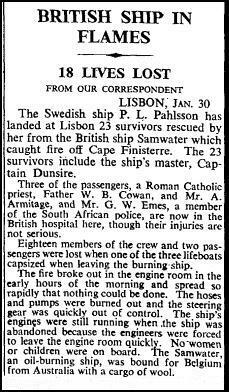 Only 6 months later, on January 31st 1947, the SS Samwater burned and sank off the coast of Cape Finisterre, Spain...resulting in the death of 18 crew members.